Sometimes when we get into the festive spirit at the Christmas holiday season we have a tendency to forget safety. One of the most common errors or slips in judgement made during the Christmas holiday season is the overloading of electrical outlets (receptacles) as shown in Figure 1. It is important to remember that most electrical receptacles or outlets are only rated for 15 amps and just because the outlet or receptacle has 2 plug positions, does not mean that each plug position can deliver 15 amps. All of the outlets on any specific circuit are designed to deliver 15 amps in total. Note: Kitchen electrical receptacles (outlets) are usually split, which allows for an independent circuit for the upper and lower socket of the receptacle. However, it is unusual to have any other receptacles in the home with independent circuits on each of the receptacle sockets. Note: A limited number of jurisdictions, such as Tampa, Florida, have mandated that each residential electrical circuit be capable of delivering 20 amps. 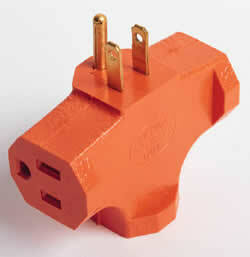 The addition of cube taps, as shown in Figure 2 or power strips, as shown in Figure 3, do not increase the current delivery capabilities of a circuit or receptacle (outlet). The total current that a circuit can deliver is represented by the size of fuse or circuit breaker in any specific circuit. The manufacturers of Christmas tree lights also make it convenient to overload a circuit by providing a socket where another string of lights can be added to the last. One might assume that you can continually add additional strings of lights. 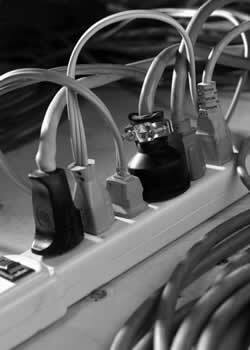 The manufacturers of extension cords also make it easy for us to overload electrical circuits. Many of the indoor electrical cords have cube taps molded into the socket end allowing us to plug in multiple strings of lights and other electrically powered ornaments, as shown in Figure 4. 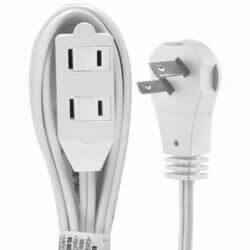 Note: Many indoor electrical extension cords are not rated for the full 15 amp capacity of the electrical receptacle or outlet. 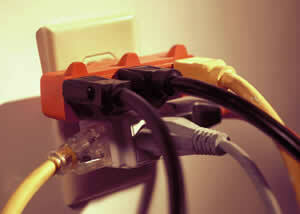 If you use a power strip, multiple strings of lights connected to each other, cube taps or a combination of these items you should check often to see if there is heat buildup where the devices are plugged into one another. If you cannot hold the connection in your hand for an infinite amount of time without it getting so hot that you must release your hand, you have created a potential fire hazard! Christmas is a time filled with love and joy, let’s not ruin this occasion by forgetting electrical safety in our home lighting and decorations.